The roster of Fallout: New Vegas companions has been revealed and includes a doctor, a soldier, a schizophrenic Nightkin grandmother and a Mark III Cyber-Hound. Wandering the wasteland is never as much fun alone as it is when you've got a friend at your side to help bear the load and share the laughs. Companions have always featured prominently in the Fallout series and Fallout: New Vegas is no exception. Players will be able to take one humanoid and one non-humanoid pal with them on their journey across the blasted desert. But who will it be? Someone conventional and practical, perhaps, like Boone, the young, tough former NCR soldier, or the big-thinking doctor named Arcade? Maybe you're the sort who believes that personality goes a long way and you'd be more interested in Lillian, the 203-year-old grandmother who also happens to be a heavily-medicated Nightkin Super Mutant who suffers from "dangerous schizophrenia?" Or possibly Raul, the ghoul mechanic with a "long and storied history" as a wild Mexican gunslinger? 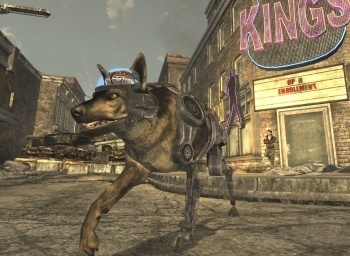 Choices on the non-humanoid side of the coin are a little thinner: A heavily-customized, banged-up Eyebot named ED-E and the obligatory Fallout dog, albeit one with a twist: "Rex is a cybernetic dog that has been around since pre-war times," his bio says. "He was used by the Denver Police Department and Caesar's Legion before being mostly blown up during the Battle of Hoover Dam. Since then, he's been the loyal pet of The King of The Kings in Freeside. Capable of sniffing out loot and taking a large amount of punishment, he only has one (big) problem: his brain is starting to deteriorate." The full list of Fallout: New Vegas companions and images has been posted on the PlayStation Blog, but consider yourself warned: Minor spoilers are hidden within. View at your own risk! Fallout: New Vegas is scheduled for release on October 19 for the PC, Xbox 360 and PlayStation 3.